I love books on writing. Books on writing are a lovely distraction from the real thing, making me think about how wonderful writing can be or justifying the stress of the process because every writer goes through it. For me, reading books about writing must be enjoyed like vacations: once a year, fully immersed, and relinquished responsibly in order to return to the world of work. Last week, I found a book called, Chapter After Chapter: Discover The Dedication and Focus You Need To Write The Book of Your Dreams by Heather Sellers. The title made me laugh . . . um, when was that last blog entry? It reminded me of a conversation I had with my husband when we were first dating, when I was in college and whimpering about something having to do with my future. He told me that pursuing my dream was going to be hard, it was going to hurt, and it might take a long time. At the time, it shocked me to hear him say something not terribly encouraging but frighteningly real. I've paraphrased him many, many times since then. I needed to hear it then, and I have to remind myself of it all the time. People should tell kids that: sure, they can do anything if they set their minds to it, but they have to set their actions to it, too. Chapter After Chapter forces acknowledgment of reality with similar reminders, but it's also funny, encouraging, and filled with lots of exercises that aren't about crafting a chapter but about getting used to the work--focusing on the work. One of the first assignments is a Book 100 list, which should consist mostly of books "like the one you want to write." The list serves to make a writer familiar with her chosen market and learn the techniques of others who are writing similar books. Reading that many books will probably take about a year, Sellers says, but it's supposed to also be an exercise in discipline. Since I have a lot of research I want to do anyway, and since I have several lists of books already, this sounded like a productive plan. I started with the book waiting on hold for me at the library, Eleanor Agnew's Back From The Land. The whole reason I was even at the bookstore and happened upon the book Chapter After Chapter was because I was looking at books on self-sufficiency and living off the land. One of my friends recently posted a photo on Facebook of her hay bale garden, and I realized that a little creativity could result in some gardening success even though I don't have a yard. Besides that, with all the crazy weather lately, I thought knowing how to fend for myself in the case of widespread food shortages wouldn't be such a bad idea. I was looking at books about how to prepare for an emergency, how to feed a family of four with a quarter of an acre, and how to live off the grid. 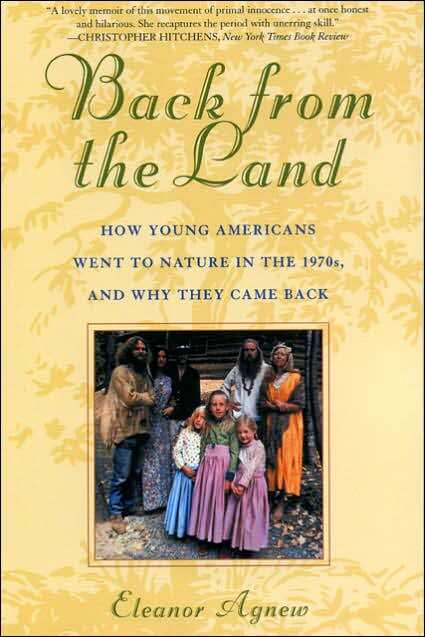 In the back of my mind, though, I knew I'd have to read Back From The Land first, a book about people in the 1970's back-to-the-land movement who, well, came back to civilization. I didn't choose this book because it has much to do with what I want to write about per se, but it does highlight an interesting phenomenon of protest through voluntary removal from society. The stories in the book surprised me. The first surprise was how much people relied on the publication Mother Earth News, which is still around, and how often it led people astray. "Mother," as back-to-the-landers called their beloved magazine, told them how to make a living off of worms, or off of fruit crops, but not how to recover when a freak hail storm wipes out a crop. How little people actually knew about the land they chose to go back to also surprised me, but I do live in the internet age. Groups would go where the land was cheap, and then they would discover the land was cheap because the winters were brutal, or bedrock lay not far beneath the topsoil, or in one sad tale that ended in a woman developing non-Hodgkins lymphoma, because the land and water was poisoned with pesticides by the former owner. Most started out having positive experiences of reconnection to the earth and to a community of peace-loving people dedicated to self-sufficiency, and some lasted in their communes or on their farms for decades. The saddest thing about their movement, though, was the voluntary poverty; most people who went back to the land came from middle-class families and didn't realize that they would still very much depend on the greater economy for manufactured goods and medical care. Flea markets and bartering only got them so far. Although the back-to-the-landers told many fascinating stories of tenacity and creativity in the interest of living simply, most who returned from the land loved their experiences but needed the stability and intellectual stimulation of civilization. They found that their communities could not supplant or topple the broader economy with its technological advances and opportunities for health, education, and retirement. I have no interest in toppling our economy or espousing a stark subsistence bereft of material enjoyment. Someday, though, I'd like my writing to help people develop a stronger, more viable economy with more opportunities and better education for greater numbers of people. It helped to read about the millions--millions--of people who turned away from the culture around them and shunned the status quo. Those people learned the limitations of poverty, especially in rural areas where it was not a way of life by choice, and they learned to appreciate the hard work that went into establishing this country. They learned how to respect the earth even after they returned to more traditional housing or upgraded their simple cabins with running water and electricity. They learned about strength in community. After finishing reading Back From the Land, I chose my next few books to reserve from the library. Last night, I consolidated my multiple book wish lists (two online, one on my computer, and one on my phone) and added several other books I found online in the process. The list will change; I only needed to get the general idea of topics I wanted to read about while landing on intriguing titles with decent reviews. The books cover so many topics, but they're all going to help me gain a better understanding of humanity and society. When I finally decided to go to bed last night, the list totaled ninety already, which got me pretty excited. It's like my own little masters program! So while I try to clear the muddy waters of the world, I'll get to share here what I learn in those books. Then one day, one day in a year or two, I'll get to share ideas in a book of my own!